Modesto CA – Deputies assigned to the Sheriff’s Team Investigating Narcotics and Gangs (STING) arrested two brothers as a result of an armed robbery investigation last week. The robbery was initially reported in the unincorporated area of Ceres, CA in February of 2017. 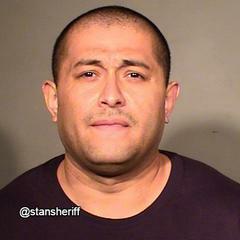 During the investigation STING deputies identified 30 year-old Alejandro Amaya of Modesto as a suspect. On 04/20/17 STING deputies served a search warrant in the 100 block of Drake Ave in the city of Modesto looking for Alejandro. During the service of the warrant they found the home belonged to Alejandro’s brother, 32 year-old Saul Amaya. 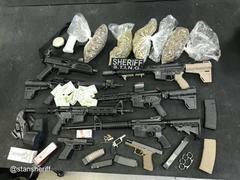 Nine firearms were also found in the home and two were reported stolen out of New Mexico. Several of the firearms were assault weapons and considered illegal to possess in CA. Saul Amaya is a convicted felon and prohibited from possessing firearms. Also found during the search of the home was several pounds of marijuana, evidence to show the marijuana was being sold and large amount of money. Saul Amaya was later booked into the county jail on various firearms related charges and possession of marijuana for sale. On 04/21/17 STING deputies discovered that Alejandro Amaya was living in the 2900 block of Keyes Road and he was taken into custody as he left his house. When arrested Alejandro was armed with a loaded firearm. Alejandro is also a convicted felon and prohibited from possessing firearms and/or ammunition. A search warrant was served at the Keyes Road address and a large amount of ammunition was located in the home along with over 200 marijuana plants. 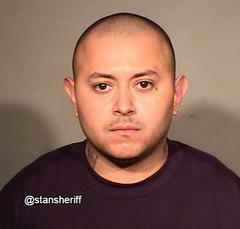 Alejandro Amaya was later booked into the county jail for the robbery and firearms related charges. Saul Amaya (photo #1) was booked for Ex-felon in possession of a firearm, person prohibited from possessing a firearm, possession of an assault rifle, possession of a short barreled shotgun/rifle, possession of stolen property, possession of metal knuckles and possession of marijuana for sale. Alejandro Amaya (photo #2) was booked for robbery, ex-felon in possession of a firearm, person prohibited from possessing a firearm, possession of a loaded firearm in a public place, carrying a concealed firearm, destroying evidence and participation in a criminal street gang.